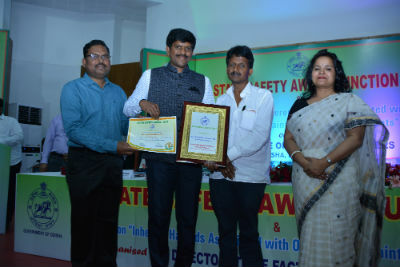 Barbil: Jindal Steel and Power Ltd. (JSPL), Barbil has bagged the second prize for ‘Lowest Weighted Frequency Rate of Accidents for the year 2017’ by Directorate of Factories and Boilers, Odisha. JSPL has been selected by State Safety Award Committee under the chairmanship of Director of Factories and Boilers. JSPL Barbil Unit Head Shri Suresha G and Shri Hercules Jena- Head, Occupational Health & Safety (JSPL, Barbil) received the coveted award from Shri Susanta Singh, Hon’ble Minister of State Energy and Labour & Employees’ State Insurance Corporation in the presence of Smt. Anu Garg, IAS, Principal Secretary, Labour and ESI Department, Govt of Odisha on March 10, 2018 in a function held at Bhubaneswar. Among other dignitaries, Shri Kamalendu Mohapatra, Director of Factories and Boilers, Odisha and Shri Malay Kumar Pradhan, Dy. Director of Factories and Boilers (Safety), Odisha were also present on the occasion. The event was an acknowledgement of excellent work in the field of occupational health & safety across industrial workplaces of the State. 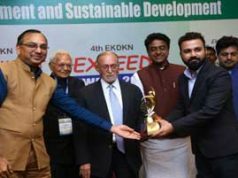 In October last, JSPL Barbil had won Golden Bird Safety Award (Platinum) for best environmental practices and implementing workplace safety norms by Foundation of Accelerated Mass Empowerment (FAME), India.